Finally the last of our fall visitors are featured today! Patrick's mom visited (check out our day trip to Saxapahaw), my mom visited (check out our savory brunch), and now we have friends visiting! These friends are a little UNC-sided. Since it was UNC's homecoming "my" friends were in town and staying with us. Our house is open to Dookies too though! Everyone arrived Friday in anticipation of an early afternoon football game. Saturday morning we went to campus early so we could enjoy campus a bit and then watch the UNC football win! How exciting! 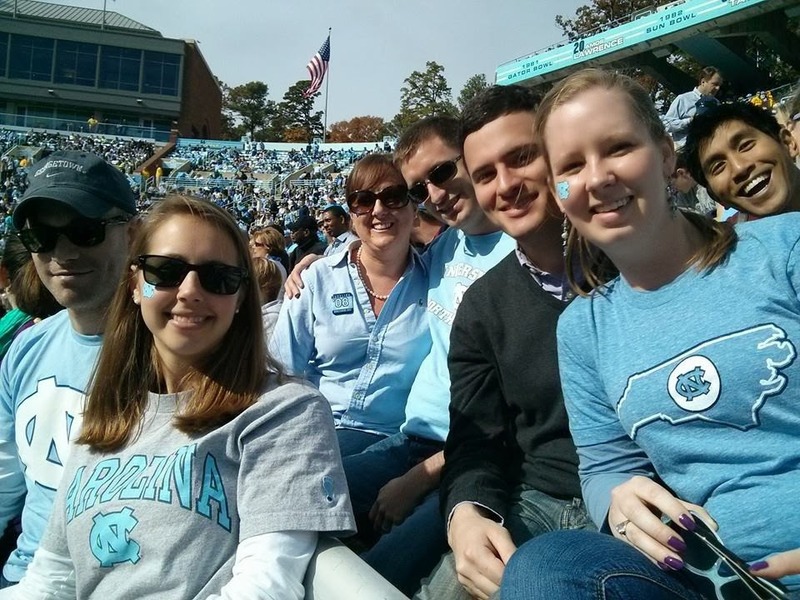 James, Holly, Christine, Kasper, Patrick, Whitney, and Richard all cheering "Go Heels!" Before our guests left Sunday Patrick and I put together a brunch for them. I forgot to take a picture of the spread but we served: grits, bacon, breakfast egg casserole, and blueberry muffins. The breakfast egg casserole is seen in this breakfast potluck post. And the blueberry muffins were from the Smitten Kitchen blog; the recipe is below. Preheat oven to 375°F. Line a muffin tin with 10 paper liners or spray each cup with a nonstick spray. Beat butter and sugar with an electric mixer until light and fluffy. Add egg and beat well, then yogurt and zest. Put flour, baking powder, baking soda and salt into a sifter and sift half of dry ingredients over batter. Mix until combined. Sift remaining dry ingredients into batter and mix just until the flour disappears. Gently fold in your blueberries. The dough will be quite thick (and even thicker, if you used a full-fat Greek-style yogurt), closer to a cookie dough, which is why an ice cream scoop is a great tool to fill your muffin cups. You’re looking for them to be about 3/4 full, nothing more, so you might only need 9 instead of 10 cups. Bake for 25 to 30 minutes, until tops are golden and a tester inserted into the center of muffins comes out clean (you know, except for blueberry goo). Let cool on rack (ha), or you know, serve with a generous pat of butter. The sour cream gives these muffins the perfect bit of tang! They were a hit; Patrick even says I can make them again! Do you have a favorite blueberry muffin recipe?